There are many news saying that apple has launched a waterproof cell phone iPhone 6S and 6S plus but are all these news true? Well this article talks about this secret feature of Apple. According to me Apple is not that sort of company that will kept its features secret especially if the feature gives new iPhone an edge over the competition. Water proof smart phones have the external design that compliment this feature but currently iPhone 6S and 6S plus don’t have a plastic coating on connection ports like USB and headphone jack, which is why both devices don’t have plastic plugs over all external connections. 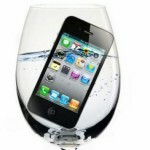 So moisture will continue to enter into the smart phone upon dipping it into water. Maybe future iPhone series will have this feature but currently Apple haven’t sign any kind of patent like this. Testing seems to suggest that while the iPhone 6s and 6S Plus do seem able to survive a quick dip (although there are no guarantees), prolonged submersion will still kill them both. Experiments have been performed by many researchers in order to prove this water resistance of iPhone 6S and iPhone 6S plus. In first experiment iPhone 6S was placed against the Galaxy S6 in a small container completely full with water. Both smartphones were taken out after thirty minutes and appeared to retain their entire functionalities afterwards. In the second experiment iPhone 6S was compared against the iPhone 6S. After an hour of surviving this liquid test when both smartphones taken out and they retained all their major features like camera, 3D touch and other basic touch screen responses. But the recent video shows completely different results than the previous two. In this experiment iPhone 6S and iPhone 6S plus were placed in swimming pool under four feet of water. After a minute iPhone 6S undergo slight screen touch issues but after two minutes of dipping, these smartphones completely fade out and start to became hotter and hotter and then about two hours later these sets were completely dead and couldn’t woke up. However iFixit reports suggests that iPhone 6S and 6s plus are able to survive liquid damage more smartly than their previous peers because of their water-resistant exterior design. In an experiment conducted by some researchers they came to know that these smartphones can be able to survive short term water immersion but they can be damaged if put into water for long period of time. They observed that survival rate also depend upon the quality of water. Clean tap water gives them a great chance of survival than corrosive sea water. In a recent experiment some researchers found something new that was not there in previous iPhones. When they opened 6S they saw a very mysterious thing, some kind of adhesive material secured with screws was securing the internal surface of the mobile. That was quite weird. Outer covering was very difficult to remove and was removed only with the help of iSclack, a grunt-saving tool. So the researchers’ suspicion rise towards only one point and that was waterproofing. Apple has been investigating a waterproof (or, more accurately, liquid proof) iPhone for at least the last several years. Because that adhesive material was not put there to hold the screen so there remain only one point which indicated that Apple tried to make their smartphones water resistant. Just like a jacket. There is also a remarkable change of 0.3 mm in width of the lip running along the perimeter of the frame. And it’s pretty suitable for the jacket to adjust on it. Not only this Apple also created a tiny silicon seal over every cable connector on the board from the battery and display to the lightening port and buttons because all these areas are very sensitive and prone to aquatic excursion. Apple filed a patent for waterproof silicone seals on board-to-board connectors just this past March. It appears this is one patent they’ve rapidly put into production. Other parts of the iPhone 6S like power and volume buttons don’t undergo a drastic change although there is a little change in their design as well but in recent Apple patent filings there is no strict waterproof profile reserved for these areas. There are rumors that Apple reserved this awesome feature of complete waterproofness for its new upgrade; iPhone 7. And this has to be one of the features which are going to be the most anticipated ones of them all.